Hyperbole isn’t adequate enough to describe the buzz coming out of my first CiderCon Cider Share. 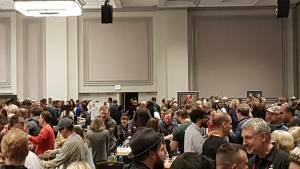 As you will see from the photos this is a large room lined with ciders and their makers from across the USA and overseas. It is what it says, namely a forum for cider makers to bring their ciders to be shared with others. With light refreshments served throughout and small tasting glass in hand you can browse all the ciders there. By my estimates there were several hundred of which you could sniff, sip, slurp, swill, appreciate and devour; and informative and passionate cider makers to explain what they were all about. The ciders ranged from conventional to those pushing boundaries in multiple directions. It really was a cider maker’s nirvana. Suffice to say I did not manage to taste them all but I gave it a good shot and here below are a few of those that I came across. 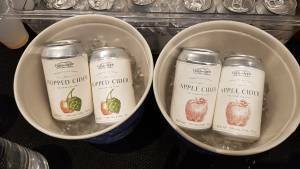 The Hand and Apple Hard Cider Company, the first Korean Craft Cider company had two eminently quaffable ciders, one a well-balanced medium dry dessert apple and the other a cider with a perfect pitch of hops. Green Bench from St. Petersburg Florida had a superlative dry cider called “I AM BRUT”. This little puppy is fermented in oak barrels with a cultured yeast which Khris and his team pulled over from their other project, a brewery. 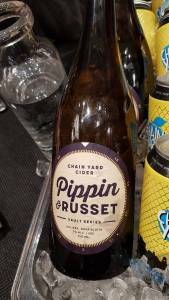 This cider had delicious fruit berry aromatics and a subtle flavour that caressed the tongue. If you can get your hands on this it’ll be a treat. 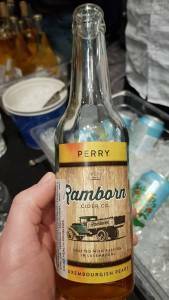 Ramborn from Luxembourg make simply the most appealing Perry I have enjoyed with crunchy tannins, all from trees in Luxembourg. It’s a winner for me and one I would recommend. The Canadian contingent had a great representation and here below are 2 of that very good bunch. 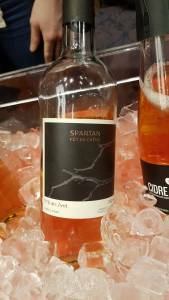 The Quebecois Spartan Fut de Chene aged in oak barrels was an elegant drink akin to a wine. And Chain Yard cider came along with multiple varieties but a familiar tannic Pippin & Russet got my vote. 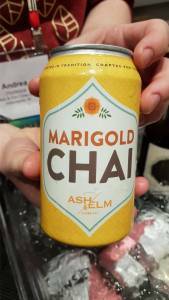 And from the more exotic end I would draw out Marigold Chai from the Ash & Elm Cider Company, a blend of cider, ginger and chai tea that was extremely smooth and enjoyable. 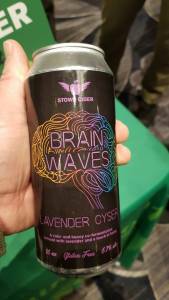 Stowe Cider brought along Brain Waves a Lavender Cyser which was unique and very floral (at the risk of stating the obvious). 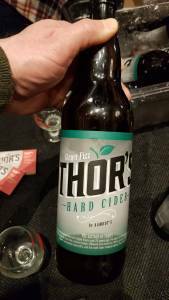 And one that I found intriguing was by Thor’s Hard Cider. I trod warily when offered their jalapeno flavoured cider expecting something firey and overbearing but in reality it was light refreshing with hints of cucumber and pepper. And there were so many more, all mixed in with making new acquaintances and finding familiar friends. It really was exceptional. Congratulations to USACM, its volunteers and all the cider makers in their multitudes. Thank you.